If you are looking for a good replacement for your old HPS grow light then you have come to the right place because here we are going to discuss how the Bestva 2000W LED grow light is more than enough to do the job. In this review of the 2000W LED grow light from Bestva, we are going to discuss everything that this grow light offers for your indoor marijuana plants and if this grow light is worth it or not. So, without wasting any time, let us get into the review. The parent company and the manufacturer of the brand Bestva is Shenzhen King Lighting Co. They have been a leading manufacturer of grow lights for indoor marijuana growing for a long time now. They also have a manufacturing unit all the way in China as well. These manufacturers have established in the grow light for indoor marijuana growing market by shipping some revolutionary products and technologies such as the double chip which is also known as the DC series, Smart series, and the Elite series in order to make the best grow lights for indoor marijuana growers. It does not matter if you are a beginner or an experienced indoor marijuana grower, this manufacturer will have a grow light for you regardless. They have been manufacturing grow lights since 2011 and have made quite a large fanbase for themselves with the help of their quality products. Its been 8 years and it just shows that the manufacturers have gathered a lot of experience in their area. Now let us get into the review of the of this LED grow light. Build – How strong is it? The Bestva 2000W is strong enough that it is meant to last at least a 100K hours. This is the theoretical figure that has been provided by the manufacturer of this LED grow light. However, considering the quality of this grow light, you can easily assume that you are not going to face a lot of difficulties with the LED grow light for at the very least 5 to 7 years of regular use. This can be a very good grow light if you are just a beginner as it offers the of light for your indoor marijuana plants. The complete grow light starting from the body on the outside all the way to the board and inner chips on the inside, the Bestva 2000W grow light has been made by using only the highly reliable and top quality materials. This LED grow light weighs in at 10.36 pounds and has the dimensions of 21” X 8.5” X 2.3”. The Spectrum – Is it enough for your indoor marijuana plants? This LED grow light from Bestva comes being equipped with 200 pieces of LED bulbs which are 10W each. All these LED chips are dual chips and when switched on, they emit some of the most intense lights for your indoor marijuana plants. The diode which is dual chip will also help you in decreasing the excessive power that is consumed. The Bestva 2000W grow light will provide your indoor marijuana plants with a full spectrum of lights that is very necessary for your indoor marijuana plants to grow into healthy plants and provide you with the best quality of end product. This LED grow light does include the IR and UV lights as well which are both very essential for your indoor marijuana plants. This LED grow light has a spectrum composition which ranges from 380 nm to 780 nm. Here the warm and cool white are going to be supplemented by the light at 3500K and 7000K respectively. All the LEDs in Bestva’s 2000 Watt grow light are arranged at 120 degrees which are going to make sure that the light is being spread evenly to your indoor marijuana plants and it will effectively avoid any harm to your indoor marijuana plants as a direct angle LED grow light would do. This angle in the light will also mean that the light penetration rate is being increased in your indoor marijuana plants. This is all going to result in much-improved health of your indoor marijuana plants. This 2000W LED grow light from Bestva comes with a very good balance of red and blue lights in its spectrum and it is more advanced and will help in the process of photosynthesis of your indoor marijuana plants a lot as well. The full spectrum means that you will be able to use this grow light at all the stages of your indoor marijuana plant’s growing cycle whether it be the veg stage or the bloom stage, you will be able to provide your indoor marijuana plants with all the essential lighting with the Bestva 2000W grow light. Energy Efficiency – Is this grow light a power-hungry grow light? The 2000W LED grow light from Bestva will only consume a mere 390 Watts of electricity when in use from your wall. This means that it is not a power-hungry grow light and is going to save you a lot of money on electricity bills as you use it for your indoor marijuana plants. The manufacturer has observed that their grow light can give a reading of 760 uMol when placed at the height of 18”. As for the Lumen output, the Bestva 2000W gives around 20K lux output while being switched on. Even though the light consumes such low amount of power, it can easily replace a power-hungry 1400W HPS grow light system. Coverage – How much can this grow light actually cover? Here let us discuss one of the most important features of a grow light that you would want to confirm before buying for your indoor marijuana plants in your grow tent. As far as the 2000W LED grow light from Bestva is concerned, it offers a coverage area of 7.8” X 7.5” worth of grow space when you hang this grow light at a height of 24”. 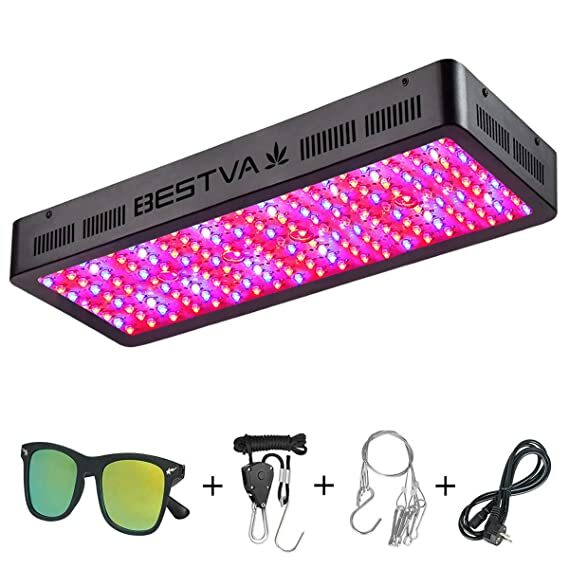 While this number has been recommended by the happy customers of the Bestva LED grow light, the official number that the manufacturer has provided about this grow light is that when it is hanging 24” away from your marijuana plants, it can provide you with a coverage area of 7” X 6.5”. We would like to personally recommend you that you keep the LED grow light closer to the canopy when your indoor marijuana plants are in their flowering stage of the growing cycle. Doing this, you will get the highest possible and the best quality of yields from your indoor marijuana plants. You can easily compare the Bestva 2000W grow light to the reflector series grow lights in the market and when you compare them, you will know that Bestva’s LED grow light will give you double the coverage of what any of the other grow lights has to offer. This 2000W LED grow light from Bestva has earned raving reviews from the people that have already bought this grow light and are using it to grow their own indoor marijuana plants. However, if you are not looking for this much coverage area from your grow light then you should not go for this grow light but instead, go for a grow light which is 600W and not 2000W. Cooling – Is the temperature going to be stable in the grow room? If you are worried about the temperature management of your grow tent then know this that the Bestva 2000W comes with the most scientifically designed grow panel on it which makes sure that neither the grow light itself or the grow tent gets heated no matter how many hours you decide to keep the grow light switched on. The cooling system in the this LED grow light helps in keeping the extra heat away from your indoor marijuana plants. This grow light comes along with a number of cooling fans inside it along with the much improved scientific aluminum heat sink technology which is ultimately going to help in keeping the temperature inside the grow tent norma and prevent it from over-heating which can be very harmful to your indoor marijuana plants. Bestva’s LED grow light itself runs very cool and does not produce a lot of heat, to begin with, which needs to be dealt with later on and this helps in keeping the temperature under control. There are a lot of people who are happy with the performance of this grow light from Bestva in their grow tents regarding the temperature and this huge fan base is what makes this grow light one of the most budget-friendly grow light in the market which can go head to head with any costly grow light which is offering similar features. The manufacturer has stated that the working temperature of the 2000W LED grow light from Bestva is somewhere in between 68 degrees Fahrenheit to 104 degrees Fahrenheit which is very good for an LED grow light in this price segment. The Bestva 2000W LED grow light cannot be considered just a short term investment, if you purchase this LED grow light then you will be making a long term investment. As we all know that this is an electrical product, this means that from time to time there might be some problems as there is with all electrical products but what we have to know is that how the manufacturer is going to help you deal with those said problems with their products. If you decide to purchase this LED grow light then you do not need to worry about any of that as the manufacturer is very well known for its after-sales customer support quality. When you buy the Bestva LED grow light, or most other Bestva products for that matter, you will get a warranty which is going to last for 3 whole years after the purchase. However, it does not end here, the manufacturer is also ready to hand all the customers who buy this LED grow light with a 30 day satisfaction guarantee which means that if you are not satisfied by the 2000W full spectrum LED grow light from Bestva for any reason whatsoever, you will be able to return this LED grow light within the first 30 days of purchase directly to the manufacturer and get all your money back without any sort of hassle whatsoever. All this just adds to the fantastic list of features that the Bestva’s LED grow light already has. It is an affordable LED grow light. This LED grow light comes with the Dual Chip technology. It boasts a full spectrum of lights. It is an energy efficient grow light: a rarity in the markets. You can control this LED grow light by the help of the timer. Bestva’s grow light is the best LED grow light in terms of the impressive coverage area that it offers. This LED grow light comes with a very good ratio of Red and Blue lights. This LED grow light can easily replace a 1400W HPS system. Bestva’s LED grow light can provide the needed light for all phases of your indoor marijuana plants’ grow cycle. This LED grow light will keep the temperature in your grow tent under control. The manufacturer offers tremendous customer support. The LED grow light from Bestva is not waterproof which means you will need to keep it away from any water bodies. This LED grow light does not come with the Daisy chain feature. The Bestva 2000W is only for indoor use and it has less lifespan when compared to other LED grow lights. Along with the 2000W LED grow light, you will get a pair of safety glasses. In the package, you will also get a hanging kit which will include hooks and strings which will allow you to hang the grow light wherever you want to and adjust the height however you like. You will also receive a 6 feet power cord which will allow you to place the grow light wherever you want to and you will also get a warranty card along with the manual which is going to help you complete the setup of this LED grow light without any inconveniences. If you are in the market for a very good LED grow light which is also budget friendly then the Bestva’s full spectrum LED grow light (2000W) is the best option for you. Bestva 2000W is capable of providing the best light that is needed for your indoor marijuana plants and the footprint of this LED grow light is also very impressive. As far as the price is concerned, this 2000 W LED grow light from Bestva is going to offer you the best amount of coverage in the whole market. We would like to recommend the Bestva LED grow light (2000W) to those who are looking for a good and affordable LED grow light for their grow tents with the space of 6” or 7”. This LED grow light from Bestva is already going to cost you less money when compared to some other LED grow lights in the market but it will also save a lot of your money in electricity bills as it is a very efficient LED grow light. We hope our Bestva 2000W review helped you in understanding this LED grow light in a way which will help you in making the decision to buy it or not. However, we personally recommend that you go for it as it is one of the best LED grow lights in th market in its price range.